The Putnam Hill Chapter DAR Regent's Project is the Historic Preservation of Putnam Cottage – Knapp Tavern Museum in Greenwich, Connecticut. This project is funded entirely by private donations. Make donations here by credit card, check or PayPal conveniently, securely and directly through our chapter website. Simply click on the "Donate" button below and you will be directed to check out, where you may select the amount of your donation. PayPal's reduced transaction fee for non-profit entities of 2.2% plus $0.30 will be included in your payment as indicated. 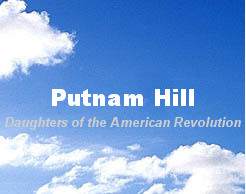 A list of projects is available at the websites of Putnam Hill Chapter DAR, CTDAR and NSDAR. Your donation is tax deductible to the extent allowed by law. Thank you for your support.